Save the date for a brand new event, Barrel & Board set for Thursday, February 25, 2016 at The MonOrchid art gallery in Phoenix. Hosted by the Scottsdale League for the Arts, this fundraising event pairs three of your favorite things – whisky, beer and cheese boards – for a night of dapper distinction and delightful debauchery. To set the mood, local acoustic guitarist, Tom Kumagai will perform live. Food and drink highlights at Barrel & Board will include barrel aged whisky and craft beer from SanTan Brewing Company, Scottsdale Beer Company, Fate Brewing Company, Arizona Distilling Co, High West Distillery, Del Bac Whisky, Dry Fly Distillery and more. 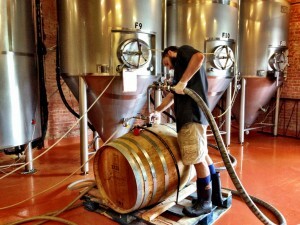 Angel’s Trumpet Ale House will pour a variety of local, rare and aged beers. Enjoy educational demos, sample craft beer paired with some of the Valley’s favorite cheesy delights and cast your vote for your favorite pairing. General Admission tickets to Barrel & Board cost $45 online during presale and $55 at the door. Tickets include unlimited cheese samples and other tasty bites, 4-oz beer samples, 1-oz whisky samples and a souvenir tasting mug. Barrel & Board will be held at The MonOrchid located at 214 E Roosevelt Street, Phoenix, AZ 85004. For tickets and more information, visit: www.scottsdalefest.org. Traditionally, the Scottsdale Culinary Festival activities span an entire week in mid-April. This year, the Scottsdale League for the Arts is adding new events and breaking up the annual events across January – April, in an effort to cater to a wide range of interests and cultural experiences.